There is a great deal that is not known about the origin of the Australian Shepherd. In the last half of the 1800’s, and in the early 1900’s, the Western United States imported thousands of wool sheep from France, Spain, England, New Zealand, and Australia. It is reasonable to assume that the caretakers of these sheep brought their dogs with them. In the Western U.S., the Basque shepherd and his little blue dogs came to represent the sheep herding industry every bit as much as did the Scotsman and his Collie in Britain. Exactly how these dogs picked up the name of Australian Shepherd will probably never be known. However, if is certain that the Basque shepherd, with his tramp flocks and his little blue dogs herding sheep that originated in other parts of the world, influenced the breed. There does exist in Australia a breed similar to our Aussies called the German Coulie. As our country developed, stockmen were tremendously impressed with these very capable working dogs and their ability to handle any type of livestock. Identifying them with the sheep herds from Australia,they started to refer to them as Australian Shepherds and began developing the breed in America. The fact that they also excelled as cattle dogs made them the ideal dog for many types of operations. Since the first Australian Shepherds, Aussies have been used for many things. Their ability with livestock coupled with their eagerness to please and their devotion to their owners,made them the ideal family, farm and ranch dog. Their basic ability is for use on livestock and the fancy still maintains this through actual use on ranches and through competition at stockdog trials. The Australian Shepherd is a well-balanced dog of medium size and bone. He is attentive and animated, showing strength and stamina combined with unusual agility. Slightly longer than tall, he has a coat of moderate length and coarseness with coloring that offers variety and individuality in each specimen. An identifying characteristic is his natural or docked bobtail. His gait is smooth, free and easy, showing agility and efficiency of movement in a balanced ground-covering stride. He works silently and swiftly. The Australian Shepherd is intelligent,primarily a working dog of strong herding and guarding instincts. He is an exceptional companion. He is versatile and easily trained,performing his assigned tasks with great style and enthusiasm. He is reserved with strangers but does not exhibit shyness. Although an aggressive authoritative worker, the Aussie is a gentle friend and ideal home companion. The only recognized colors are blue merle, red merle, solid black and solid red. All varieties may be with or without white and/or copper trim. Preferred height for males is20-23 inches and for females, 18-21 inches. Australian Shepherds are considered by many people to be the ideal dogs. Their medium size makes them the perfect house and car dog, yet they are formidable enough when need be. Their uncanny intelligence, whether herding livestock or being a companion, is always at work. The Aussie’s loyalty and devotion are beyond question. If this is the kind of dog you are interested in, consider the Australian Shepherd. 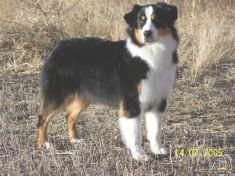 When choosing an Australian Shepherd, it is important to consider the dependability of the breeder and the ancestry of the dogs offered for sale. It is to your advantage to visit the breeder so that you may examine the dogs for sale as well as the breeding stock and facilities. If you cannot visit the breeder, you should ask questions regarding the personalities, working ability, accomplishments and talents of the parents and ancestors. You should be sure the dog is registered with the ASCA and AKC. We cannot overemphasize the importance of buying from a reputable breeder. Reliable breeders will NOT knowingly misrepresent their puppies or dogs, and most will guarantee against inherited defects. If you are buying a puppy or a dog to work livestock, a reputable breeder will guarantee that puppy to work. It is impossible for a breeder to know for sure that a puppy purchased at any early age will mature into a show animal, be an exact size, or have a certain personality (unless they are temperament tested). Examination of parents, ancestors and siblings will help in choosing the right Aussie for you!